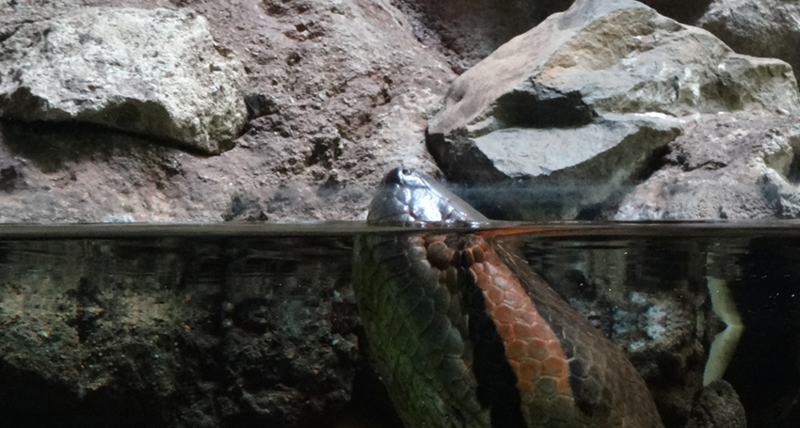 Did snakes evolve from ancient sea serpents? One of the enduring controversies in evolution is why snakes evolved their long, limbless bodies. The prevailing theory is that they evolved from lizards and are really just an extreme type of legless lizard. And as many long-bodied lizards are burrowers, there is a widespread view that snakes developed their serpentine bodies underground. 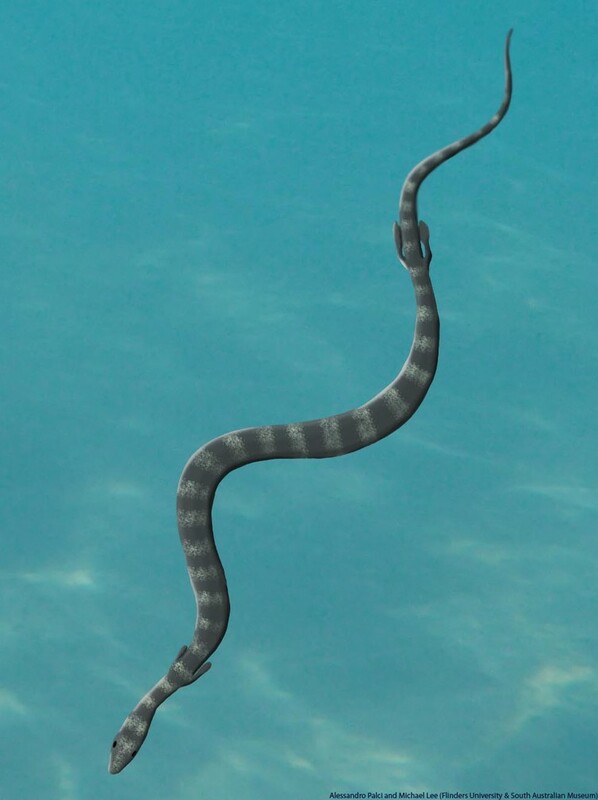 But a study of a primordial four-legged fossil snake published this week suggests it was aquatic. This suggests snakes lost their legs and elongated their bodies underwater, for eel-like swimming, before crawling ashore aeons later. The fossil in question is one of the most exquisite and controversial fossils of modern times. Dubbed Tetrapodophis (meaning “four-legged snake”), it lived alongside the dinosaurs in what is now Brazil, about 120 million years ago. Amazingly, almost every single bone is preserved in this tiny worm-sized fossil, including four small but perfectly-formed legs. This little creature was previously thought to be a burrower, and indeed looks a bit like a worm. But the study by our team suggests it has the wrong body shape for digging: the tail is too long and the legs too delicate. Conversely, Tetrapodophis possesses a range of adaptations characteristic of aquatic animals, including seals, sea turtles and ancient sea-lizards such as mosasaurs and dolichosaurs. Many wrist and ankle elements were made of cartilage rather than bone, and the limb joints were poorly developed. Such weak limbs are often found in aquatic animals where buoyancy helps with support. The hands and feet were also surprisingly flipper-like, with a thickened first digit strengthening the leading edge – like the front edge of an aeroplane wing or turtle flipper. Tetrapodophis therefore has many hallmarks of marine habits. It wasn’t a little earthworm, but rather a Lilliputian sea serpent. 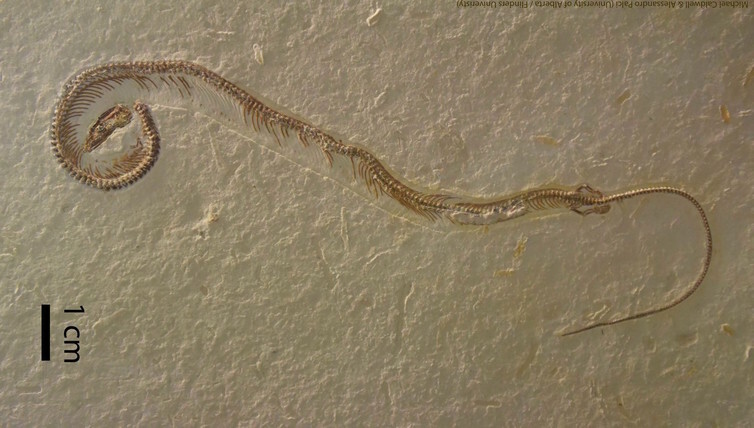 Intriguingly, there are other archaic fossil snakes that are unequivocally marine, such as the two-legged Pachyrhachis with its paddle-shaped rear end. And a recent reptile evolutionary tree proposes that the nearest relatives of snakes are not burrowing legless lizards, but the ancient sea lizards discussed above. This kinship is supported by aquatic adaptations that we found shared by Tetrapodophis, Pachyrhachis and sea lizards. All of this is consistent with the view that snakes evolved from aquatic lizards, losing their legs and elongating their bodies for eel-like swimming. This idea was more widely touted in the past but had recently fallen out of favour. But there remain some important potential difficulties with the aquatic theory. Today, snakes are tremendously successful on all continents except Antarctica. If the earliest snakes were marine, how and why did they struggle ashore? There are also some other primitive snakes that were unquestionably terrestrial, such as Najash from Argentina, which also still has two little legs. The mangrove sea snakes from north-east Australia might solve this mystery. These modern snakes are not closely related to the archaic fossil marine snakes, yet their lifestyles might have been very similar. Mangrove sea snakes inhabit the intertidal zone and are equally adept crawling on land and swimming in the ocean, so if the first snakes had similar habits, a permanent shift into land (or into the water) would have been relatively easy. This ecological plasticity would explain why many early snakes appear to be terrestrial and many others aquatic. It might also explain whyTetrapodophis has some worm-like traits, and some sea serpent traits, leading to debates about where it lived. The ongoing interest in Tetrapodophis raises other important issues. There is only a single specimen of this potential link between lizards and snakes, making it priceless and utterly unique. The fossil deposits where it was found have been scoured extensively for decades, so it is unlikely another one will surface anytime soon. It’s thus far more important than Archaeopteryx, the famous dinosaur-bird intermediate, which is known from 11 specimens. Yet, the provenance and curation of this most important fossil remains highly problematic. While Tetrapodophis was being studied, it resided in the Bürgermeister-Müller-Museum in Germany, but documents to demonstrate that it was legally exported from Brazil have not been forthcoming. The specimen is also privately owned and only “on loan” to that museum. While there has been a firm promise that it will be available in perpetuity for scientific study, enforcing this might be challenging, and it could easily disappear back into a private collection at any time. It is widely conceded that science is facing a “reproducibility crisis”. For scientific studies to be verifiable (i.e. repeatable by others), there should be open access to the primary data upon which those claims are based. For palaeontologists, this means fossils – especially pivotal ones – must be available for all scientists to examine in perpetuity, enabling independent confirmation (or refutation) of published observations. This is best achieved by making sure all studied fossils are owned and curated by a recognised museum. It is worrying that a fossil that is arguably ten times more important than Archaeopteryx could someday easily vanish from science without a trace.